Dear Mona, How Many Kids Have Trust Funds? Dear Mona, How many kids have trust funds? Thanks. This isn’t a “peek over the fence to find out what your neighbor is doing” sort of question. Trust funds are transfers of wealth, something economists have repeatedly studied for implications on economic equality. So, George, thanks for asking. A trust fund is technically “a legal entity that holds property or assets for the person who created it,” but I assume you’re interested in knowing about situations in which the person who created the legal entity is a parent or guardian and the beneficiary is their child. The most detailed data on inheritance in the United States comes from the Survey of Consumer Finances (SCF), which is based on the responses of 6,482 families. Because it’s a survey, the SCF has all the drawbacks of self-reported data, including forgetfulness and social desirability bias — if people feel shame about inheriting their wealth, they may underplay it. Still, according to the SCF, trust funds are rare. As of 2010 (yep, it’s a while ago, but this survey is only conducted every three years and SCF has yet to publish 2013’s results), 22.5 percent of respondents said they had inherited money. 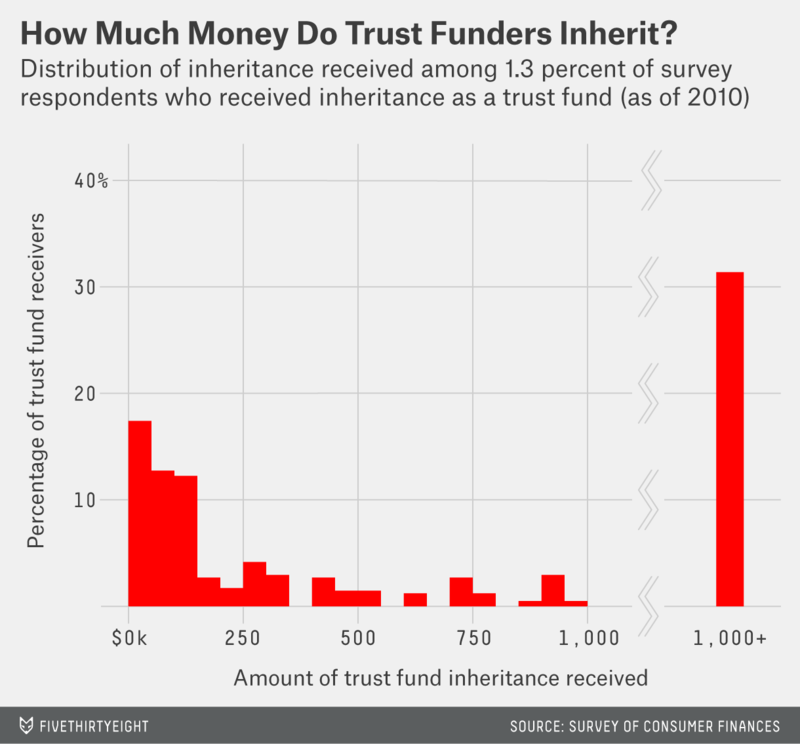 Only 1.3 percent said they had inherited money through a trust fund. After listing the largest inheritance received, the survey allowed respondents to describe a second and, if need be, a third inheritance (three was the maximum). The percentages shrank each time but remain considerable: 6.6 percent of respondents had received two inheritances, and 1.9 percent had received three. Maybe you are curious about those neighbors over the fence, George. If all those inheritances are about old Uncle Elmer setting aside 20 bucks for Liam’s 18th, those neighbors (and the data) could become less intriguing. That’s far from the reality. 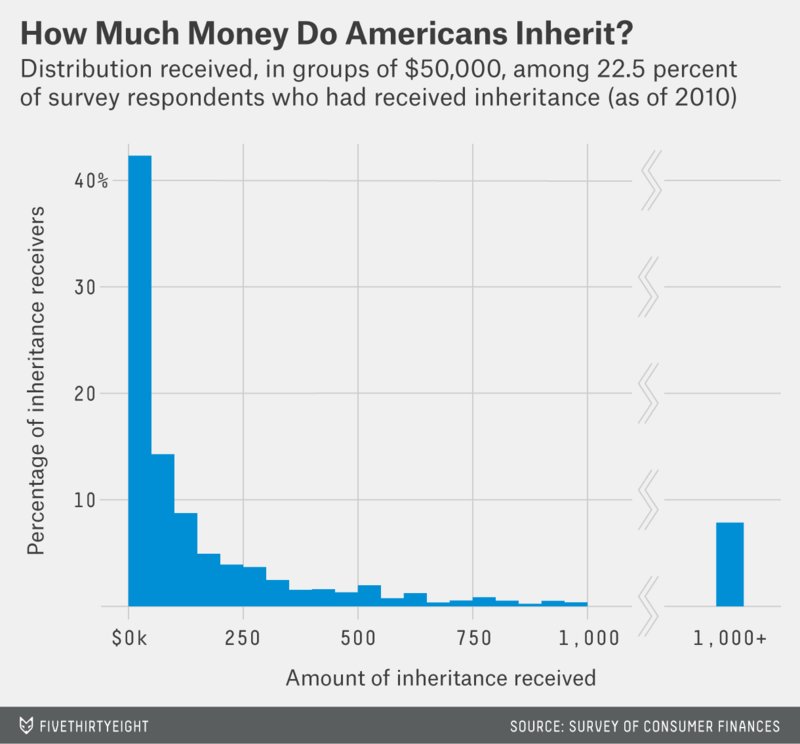 The median inheritance in the survey was $69,000 (the average was $707,291). For trust funds, that median wealth transfer was way, way higher — $285,000 (and the average was $4,062,918). The outliers here are probably lying on a beach somewhere — one respondent inherited $105,000 in 1970, followed by $220 million via a trust fund in 2000 before finally receiving a $2 million top-up inheritance in 2005. Because you specifically asked about kids, I can tell you that most inheritances — 75 percent, according to the survey — are from parents. An additional 15 percent come from grandparents (although the average inheritance from a parent is worth more than twice as much as one from a grandparent); 2 percent come from friends; and just 1 percent is from siblings. And it turns out, old Uncle Elmer might not be so stingy after all. Aunts and uncles are the grantors of 6 percent of all inheritances. When I looked at trust funds specifically, not much changes: 73 percent of grantors were parents, and 22 percent were grandparents. But remember, not that many people receive money from trust funds. So, the answer to your question would be that of the 1.3 percent of people who received money in a trust fund, 73 percent inherited from their parents. If the SCF represents a good cross section of the country (it really tries), that means that overall about 0.95 percent of Americans have a trust fund from their parents. If you’re not one of the lucky ones, don’t feel too bad, George. You’re clearly not alone. P.S. If you’re still curious about who inherits, I plan to follow up with demographics on those benefactors. Stay tuned.